Cheese Balls Get Some Respect If you hear "cheese ball" and think Play-Doh-colored processed cheese coated in tasteless crunchy miscellany, think again. Bursting with artisan cheeses and fresh seasonings, and rolled in nuts or crackers, these updates on the passe party food simply rock. Get recipes for Blue Cheese Balls With Caramelized Balsamic Onions, Farmhouse Cheddar Cheese Balls With Pecans And Bourbon, and Lemon Cheesecake Cheese Balls. I was not always ashamed of coveting the cheese ball. As a child, when it was time to decide whose house to dine at on Christmas, I always voted for the side of the family that served cheese balls. Not only did they turn the other way when I topped off my eggnog with something warming and merrymaking, but they never objected when I polished off a box of butter crackers spread with half of their cheese ball supply. Those were memorable holidays. I kept my desire quiet, praying that the nut-covered dairy treat of my childhood would grace a red-and-green decorated table when I attended a holiday party, only to have my dreams repeatedly shattered. Cheese balls, it seemed, had fallen out of fashion. I recall walking toward their front door on Christmas afternoon like it was yesterday. The air was crisp, the sun was shining, and I could see the fire blazing through a fresh application of fake snow on the window. Inside, amid trays of salami, olives and carrots with ranch dressing sat my balls of cheese wonder. They were expertly rolled in walnuts that, while no longer crunchy, were so finely chopped that no one remembered that the balls had sat on a grocery store shelf for a week or two prior. When sliced, the spheres exposed colors vibrant enough to make '80s fashion seem tame. My favorite was the port-flavored one with a poinsettia-red center that smelled faintly of bacon. Years later, I discovered with much trepidation that my admiration for the cheese ball was not universal. I learned that many were disdainful of this dish that my family and I held so dear. One winter night at a party, I ran into a group of self-pronounced foodies chatting over a bowl of hummus about dishes traditionally served in their families during the holidays. One exclaimed that her aunt never let them sit down to dinner until the annual cheese ball was finished. When I spoke kind words about her relative and, chuckling, shared that I had been known to finish a ball or two even before the last guest arrived, I was given looks of disbelief and slight disgust. Focusing mainly on cheese, Kirstin Jackson is an Oakland, Calif.-based food writer, professional cook, and food and wine consultant. When not teaching classes at the San Francisco Cheese School or Solano Cellars, her fromage musings can be found on her blog It's Not You, It's Brie and on Twitter. To my surprise, they informed me that most serious modern food lovers associated cheese balls more closely with Velveeta than Fourme d'Ambert. To them, they were relics from a former time when cheese not sliced and individually wrapped in plastic was considered suspect, and people like me, who sang praises of dishes associated with that mindset, were not to be trusted in the kitchen. So I kept my desire quiet, praying that the nut-covered dairy treat of my childhood would grace a red-and-green decorated table when I attended a holiday party, only to have my dreams repeatedly shattered. Cheese balls, it seemed, had fallen out of fashion. Then one day after recalling the good times I had at the hors d'oeuvres table as a child, I decided I had had enough. I was going to rock the cheese ball boat. I would bring this American classic into the next millennium. Using a mix of my favorite artisan dairy products and everyday ingredients, I created three of my soon-to-be most highly requested recipes of all time. I decided that rather than being based on processed spreads and products like many other cheese ball recipes, my renditions would contain the best international and domestic artisan cheeses on the market, thereby enchanting new admirers without even trying. In so doing, I discovered that cheese balls never go out of style. They just need a makeover. 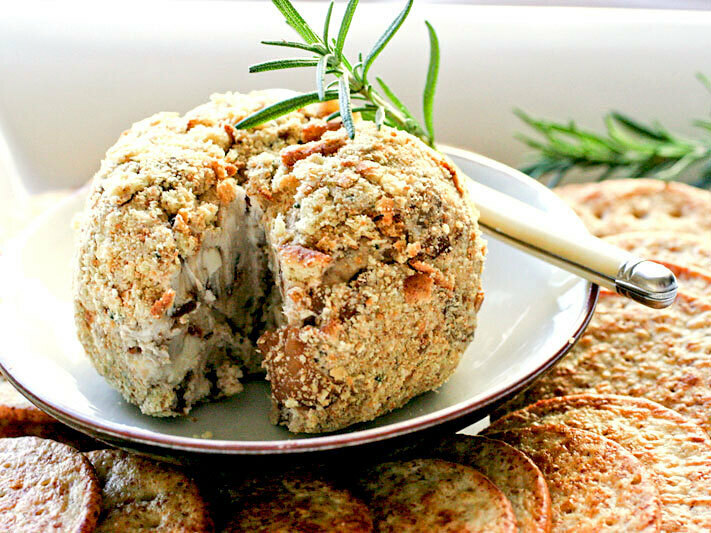 By serving cheese balls such as blue cheese with caramelized balsamic onions, farmhouse cheddar balls with pecans and bourbon, and a rare dessert ball zinger of lemon cheesecake with graham cracker crust, you'll teach your guests that everything they thought they knew about cheese balls was wrong. And, with these beauties, you might be able to forge your way onto the guest list of that Christmas mixer whose invitation got lost in the mail last year. 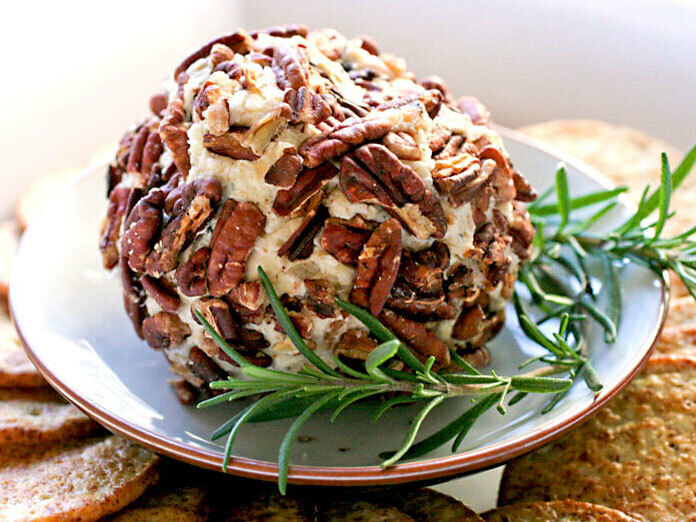 Although the balls are traditionally served during winter holidays, Cheese Ball Appreciation Day is April 17. Keep the party going. It is hard to beat the classic blue cheese and caramelized balsamic onion pairing, but adding rosemary, cream cheese and cracker crumbs makes the experience even richer. Using a mix of sweet and strong blues, like Fourme d'Ambert and Rogue River Blue by Rogue River Creamery or Valdeon, caters to guests who may normally shy away from strong cheeses, but will also please aficionados who like their cheese spicy. If you wait to pat the balls with crumbs until serving, the balls will keep for up to 3 days. Begin cooking onions in oil in a medium-sized saute pan, over high heat for 5 minutes. Lower heat and cook on low for 20 minutes or longer, until onions are caramelized and sweet tasting. Add up to 3 tablespoons of water to onions when necessary to prevent burning and sticking throughout the cooking process. Add balsamic vinegar and tarragon, turn heat to medium, stir and cook for 2 more minutes. Let cool. Stir cheeses together in a medium-sized bowl until few lumps remain. Add the onion mixture to the bowl and stir again. Add salt and pepper to taste. Form the cheese into two round, evenly sized balls and wrap in wax-coated parchment paper. Refrigerate for at least three hours or overnight. Crush crackers on a plate. Roll cheese balls one at a time in crumbs until the balls are well-coated. Refrigerate until ready to use. A sharp farmhouse cheese and a touch of bourbon add another dimension to the classic cheddar ball. Toasted pecans and cloth-bound, mature cheeses such as Lincolnshire Poacher, Fiscalini or Jasper Hill cheddars make this one an irresistible crowd-pleaser. But watch out — these cheeses are crumbly, so mind your fingers when grating and finely chop any pieces that are too small to grate. Cook onions in oil in a medium-sized saute pan over medium heat for 5 to 7 minutes, or until translucent. Add rosemary, stir and cook 2 more minutes. Let cool. Stir cheeses together in a medium-sized bowl until few lumps remain. Add the onion mixture and bourbon to the bowl. Stir until smooth. Add salt and pepper to taste. Form the cheese into two round, evenly sized balls and wrap in wax-coated parchment paper. Refrigerate for at least 3 hours or overnight. Place pecans on a plate. Roll cheese balls one at a time in nuts until the balls are well-coated. Refrigerate until ready to use. 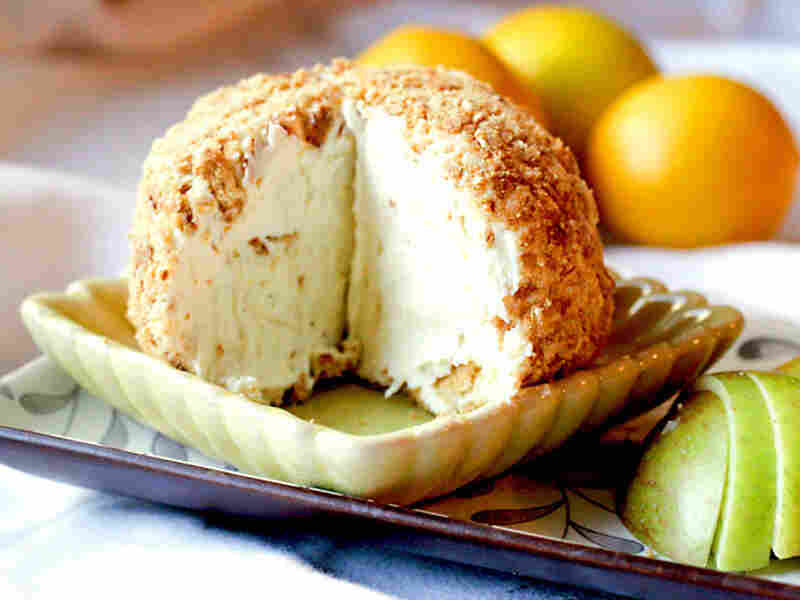 This sweet yet lightly tart lemony cheese ball is a refreshing surprise at the end of a long meal with a glass of sparkling moscato, or served alongside savory offerings at an hors d'oeuvres party. Serve with thickly sliced, crisp apples and graham crackers instead of bread or savory crackers. Your guests will never look at cheese balls the same way again. Stir cream cheese and sugar together in a medium sized bowl until there are few lumps. Add lemon zest and juice, and combine until smooth. 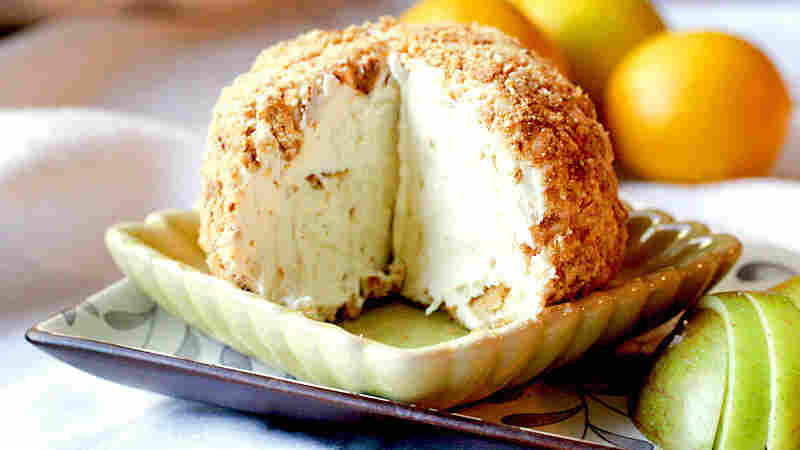 Although it is a sweet cheese ball, the lemon should taste zingy and fresh. Add more lemon juice if you prefer it more tart. Form the lemon and cheese mixture into two round, evenly sized pieces and wrap in wax-coated parchment paper. This cheese mixture is especially soft, so making a perfect ball shape may not be possible until the mixture is chilled completely. Refrigerate for at least three hours or overnight. Crush graham crackers and put on a plate. Set aside. Form cheese balls into two ball shapes. Roll cheese balls one at a time until the balls are well-coated with crumbs. Refrigerate until ready to use.